Most wallpapers are downloaded to a computer system or created by using a photo or image that is already on the system. The portable software program Wallpaper Generator offers another possibility. It can create color gradients that you can save as images to use as the desktop background on your system. The software comes only with a few options which makes it very easy to use. Colors are displayed on each corner of the interface which determine how the gradients will look like. A click on a color will open the Windows color picker and changes made to the colors become visible immediately in the preview area. The gradient can be set as the wallpaper of the computer system after all four colors have been set to the user's satisfaction. A randomize button is also available which will change the colors to random colors. 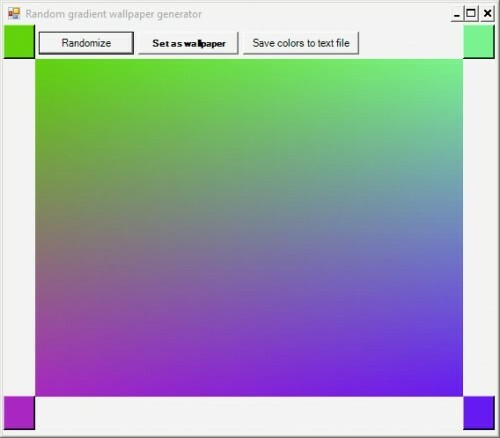 Wallpaper Generator is an easy to use program that could be useful to users who prefer distraction free backgrounds with more than one solid color. Wallpaper Generator is compatible with most versions of the Windows operating system (tested on Windows XP SP3). It requires the Microsoft .net Framework 3.5 SP1. Update: I have tested the program on a 64-bit version of Windows 7 Professional. It worked as fine as it did back on the Windows XP system. The program itself has not been updated since 2009 which is a strong indicator that the project has been abandoned by its author. Using gradients on the system as the desktop background instead of wallpaper images or solid colors adds another interesting customization option to Windows. If four colors are too much, simply select the same colors on the top and bottom so that the gradient only uses two colors instead of four for the effect. This reduces the colorfulness of the wallpaper. Hoi Martin i do not see any www link in your article do you mean to put up the link, http://www.wallpapergenerator.com/ ? Not to sound too smug, but Blackbox for Windows (bb4win) with bsetroot has done this for the last ten years… without reliance on .NET runtimes. (http://www.boxshots.org). Of course, I remember messing with something else fairly similar on KDE quite some time ago as well. Still, generative wallpaper has its attraction.